Here are 10 facts about the American artist, Andy Warhol. 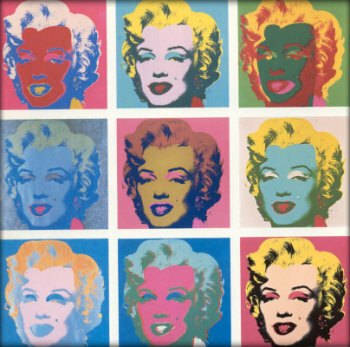 Andy Warhol was born on 6th August 1928 in Pittsburgh, Pennsylvania. He is known for his pop art and his work focuses of the crossover between celebrity, advertising and artistic expression. He worked with many forms of media, including: painting, printmaking, photography, drawing, sculpture, film and music. He also started a magazine (called Interview Magazine) and he wrote several books. He called his studio The Factory and it became a famous meeting place for creative people and celebrities. Warhol was a hypochondriac and was scared of hospitals and doctors. In the 1960s he produced a series of paintings of iconic American images and objects, these included: Campbell’s Soup cans, dollar bills, Marilyn Monroe and Elvis Presley and Coca-Cola bottles. Andy Warhol was shot (and nearly died) on 3rd June 1968. The shooter was Valerie Solanas. In the 1970s Warhol produced work for many celebrities, including: Mick Jagger, John Lennon and Diana Ross. He founded the New York Academy of Art in 1979. Andy Warhol died on 22nd February 1987 following post gallbladder surgery complications. He is buried at St John the Baptist Byzantine Cemetery, next to his parents. helps me loads with art exam thanks!!!!!!!!!!!!!! I need these facts for art homework. Great really helped with my art homework thanks!!! this helps me out with my art homework! This helped me ALOT with my art homework!!! This helped me loads with my art hmwk… thanks I would defo use this again. I got a high level in my art homework thanks to this. Glad we were able to help you out, Gemma! Thanks so much. This is my art homework due in tomorrow. great help on art homework!!!! Thank you sooooo much!!!!!!!! Helped me get out of a pickle with my art assessment … I got an A* thanks to this website hehe!! Once again, thank you!! This helped me with my Year 7 Pop Art Homework on Andy, just gotta to do Roy now. We have to produce a fact sheet. Thanks, Abby! Glad we were able to help you out. But thx this helped me a lot with my work!!!!! Thanks this helped me with Art Homework!! Please post more of these,thanks. Such a life safer it help a tone with my art topic I had I’m going to recommend to my friends this website is great. THANK YOU!!!! I have to do a report and I just needed a couple quick facts for the first page!!!! Really helped with my Andy Warhol art project! Wow, this helped me alot with my homework! Helped me with my art homework. really helped with my art homework !!!!!!!!!!!!!!!!!!!!!!!!!!!!!!!!!!!!!!!!!!!!!!! !